with the help of these Top Movie Reviews. Have any of your chicks been watching something they shouldn't? 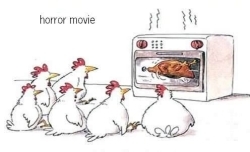 Granted, you probably don't allow them to watch any horror movies! But I would bet there was a scene or two from a movie that you wished they hadn't seen, right? But who has the time to view a movie before your innocent child watches it? Wouldn't it be nice to find a place where a homeschool family could go to find top movie reviews appropriate for the whole family? Below is just the perfect spot for you to share your favorite movies AND see what others have enjoyed! See one you've watched and liked? Please rate it with 5 Stars to encourage others not to miss it! But sometimes the author's tastes and ours did not always agree. Plus, there were movies they recommmended that we could not even locate! That is why we put this page together. The star system takes into account more than one persons point of view. You'll be able to read why different people liked (or didn't!) a particular movie. With that said, please remember that the movies everyone recommends is just that, a recommendation. The top movies review rating system shows (using stars) everyone's favorites. Movies as Literature is basically an English curriculum. Been to the theater lately? Have you viewed a family favorite from your easy chair? Or is there one that, like my children, you watched one hundred times as a kid? They had Anne of Green Gables almost memorized! Pull the cobwebs off of that long forgotten favorite and share it with us! What Is It About? Why Do You Like It? Click here to see the rest of the form and add your movie details. The following movies were submitted by other homeschoolers like you. If you've seen one, click it to rate it using the Star System. Are we missing YOUR favorite? Submit it above!